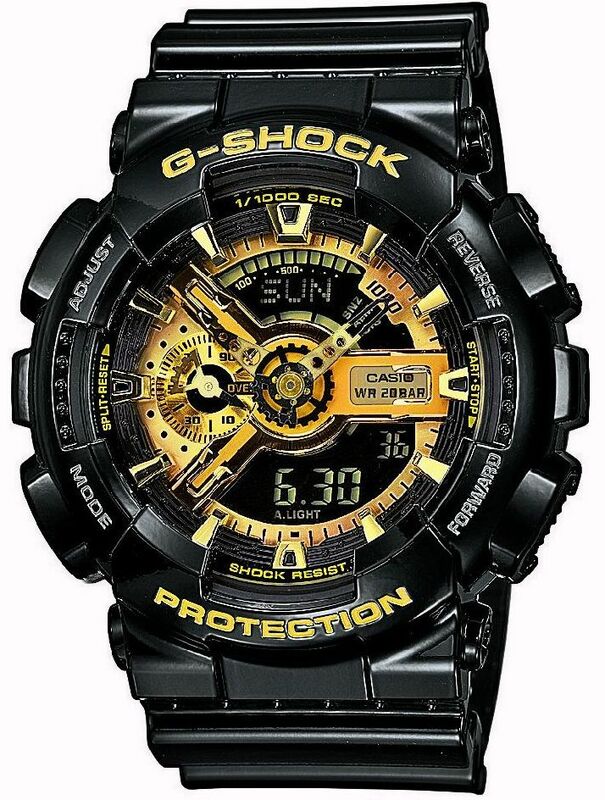 The new GA-110GB-1AER is the most exiting model of Casio G-SHOCK spring/summer collection 2012. Gleaming in gold, the watch reflects wearer’s personal style. Even in darkness, a bright Auto LED light will assure its appropriate presence and as a special bonus, the GA-110GB-1AER stopwatch offers precision timing down to the millisecond. A flick of the wrist is all it takes to activate the Auto-Illuminator background light, bathing the entire display in light. The universal time function lets the GA-110GB-1AER show the time in up to 29 different time zones. For those who wants some precision, the stop watch function measures time elapsed, splits and total time – with millisecond accuracy. It can deal with up to 100 hours maximum capacity. The countdown timer with repeat function helps remember special or recurrent events, while the acoustic signal can be timed to the second. G-SHOCK watches are ultra-modern, precise, powerful and multifunctional. They are stylish and efficient companions for the job, travels or for any other occasion where individuality is of special importance.